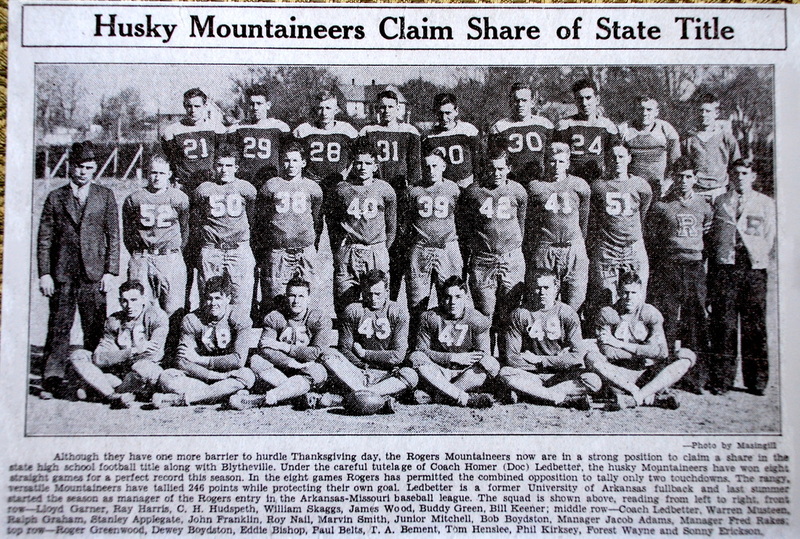 Recently Mitchell and Billie Sue Graham Hankins contacted me about a possible Remembering Rogers story about the 1936 football team. I soon learned that the team was great not only in football but many were also war heroes and outstanding citizens who shaped Rogers after WWII. This appeared to be a very interesting story for I knew that Mitchell was no slouch of an athlete himself, having played for Rogers on the 1964 State Champion team. Mitchell and Billie Sue are on the Rogers Athletic Hall of Fame board of directors and are dedicated to recognizing the achievements of Rogers School athletics and the community pride that goes with that success. Mitchell and Billie Sue have made the 1936 football team their passion and researched the lives of every player who played on the team. Sometimes this research carried them all over the country while trying to locate information from relatives and sources in different states. They have not only gathered information about the lives of each player, but have compiled data about every game, statistics, and pictures. The first game of football played in Rogers was against Bentonville in 1896 (no one knows who won). The game was played at the Fairgrounds at First and East Oak, where Christ’s Church is today. The second football field was at Locust and N. Second (the present location of Harp’s Grocery) where Rogers played until 1932. At that time, a new field with no bleachers was built on N. Eighth Street, the present location of the Post Office. It is interesting to note that this field had a six foot drop from one end to the other. In 1978, the Mounties began playing in Gates Stadium where the Heritage War Eagles play today. Mitchell and Billie Sue’s daughter, Michelle, was crown bearer for the first homecoming game in Gates Stadium. In the early days, Rogers did not have a mascot, the team known only as Rogers High School. In 1935, the school held a contest in which students wrote a theme suggesting different mascots. The winner of the contest was Berniece Price Kincy (Mitchell Hankins Aunt). She named the mascot “The Mountaineers,” and designed the hillbilly character that is still used today. At the beginning of the season, the team did not have enough shoes for all of the players. Doc made a call for help to his former NFL team, The Chicago Cardinals. The next week, a shipment of shoes arrived from Chicago. The uniforms were tattered and many unusable. With the leadership of Supt. Birch Kirksey, the community responded and raised $275 to buy 15 complete outfits. The list of donors seemed to include virtually every business and organization in Rogers. With the 15 new uniforms and the serviceable old uniforms, the team was outfitted and ready to play. The team picture that year showed the players, some with the old uniforms and some with the new ones. Stanley Applegate – became a medical doctor and practiced in Springdale. Eddie Bishop – Joined the Army/Air Force and became a jet pilot. Would often buzz Lowell in a T-33 jet trainer dipping the wings to say hello. Retired from the military. C.H. Hudspeth – Served in the Army. Owned and operated the Cleo-Vest Bottling Co. in Rogers at 310 S. First Street. Bottled popular soft drinks such as Cleo-Cola, Bubble UP, and C.H.’s Grape. Paul Belts – Served in the Army. Big time hog producer with many Grand National Champions from his farm in Hiwasse. 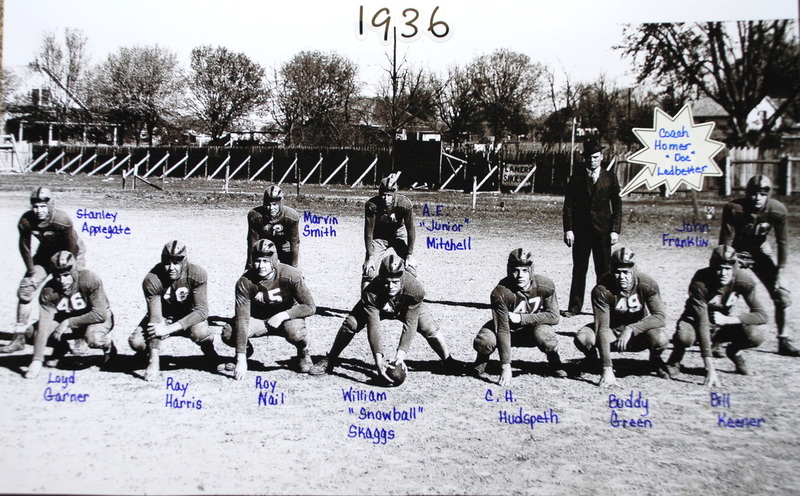 William “Snowball” Skaggs – Played college football for the Univ. of New Mexico. He joined the AR National Guard and was accepted into flight training. He flew anti-submarine patrol, was a bomber instructor, and fighter pilot. After the war, he came home to Rogers and worked in sales at various capacities until he retired. A.E. “Junior” Mitchell – Played football and basketball for the Univ. of Arkansas. Served in the military in WWII as a paratrooper. He owned the Mitchell Lumber Co. at SE corner of E. Walnut and Arkansas Streets. Johnny “Sonny” Erickson – worked for Sen. John Fulbright. His sister Edith Erickson operated Edith’s Café at various locations in Rogers. Ray Harris – Football scholarship to Hendrix College where he was “all-everything” in the conference. He and his brothers, Gene and Lawrence, owned the American National Bank which later became Arvest. James T. Wood- Outstanding college football player for the U.S. Military Academy. Served in WWII and Korea. Coach Doc Ledbetter – Coached only two years in Rogers, then accepted job in 1937 at Hobbs New Mexico. Fought in WWII under Gen. George Patton, achieved rank of Lt. Colonel. He received too many awards to mention. Returned to New Mexico and became Director of the New Mexico Highway Patrol. He died in a traffic accident in 1946, was returned home and buried in the Rogers cemetery. This is a summary of the fantastic exploits of a few men who did great things and made Rogers a great place with a proud heritage.